The Place On the latest Michelin Guide 2018, there is only one Chinese restaurant which received the 2-Michelin stars accolade. Shisen Hanten is helmed by Chef Chen Kentaro, a Japanese inspired Szechuan cuisine Chinese restaurant at level 35 of Mandarin Orchard Singapore. The hotel is part of Meritus Hotels and Resorts, which also houses the popular Japanese focused buffet line, Triple Three. I revisited the Shisen Hanten recently after having a wonderful dining experience at a four hands collaboration meal at Takayama restaurant this year. The Food As with most restaurants in Singapore, the menu at Shisen Hanten has undergone some bits of changes the past few years, though I still spot some of the familiar favourites on the menu. While the prices of the ala carte dishes are expected of a five star hotel, a better value in my opinion is to go for the Business Set Lunch (from S$42++ per person) or the 6-course Weekend Brunch Menu (S$50++ per person, minimum 4 persons). From the appetiser section, we started with the Steamed sliced Kurobuta Pork with Chilli Oil (S$24), a tender and thinly sliced pork which is delicious. Since it is also the hairy crab season, I also ordered the Fried Noodle topped with Hairy Crab Gravy (S$48). I always enjoy hairy crab more when the meat is already extracted, and this fried noodle has that nice crunchy texture, along with the luscious hairy crab gravy. It is a comforting noodle dish with bits of the sweetness from the hairy crab. If you can only have one soup, the Foie Gras Chawanmushi with Crab Roe Soup (S$36/person) is one luxe treat. I love chawanmushi and foie gras, so this is like the perfect marriage for me. The foie gras flavour is not too heavy and cloying, and is in fact very well-balanced with the crab roe and chawanmushi. For meats, go for the Roasted London Duck (S$42/half). The duck meat is succulent and is one of the dishes ideal for sharing. A seafood I would recommend to complement the meal would be the Stir-fried prawn with chilli sauce (S$44). The chilli sauce is not that spicy, while the fresh prawns come in rather big sizes which make it quite a delight to have along with the slightly crunchy texture of the prawns. Of course, I can’t visit Shisen Hanten without ordering its Chen’s Mapo Doufu (S$26). 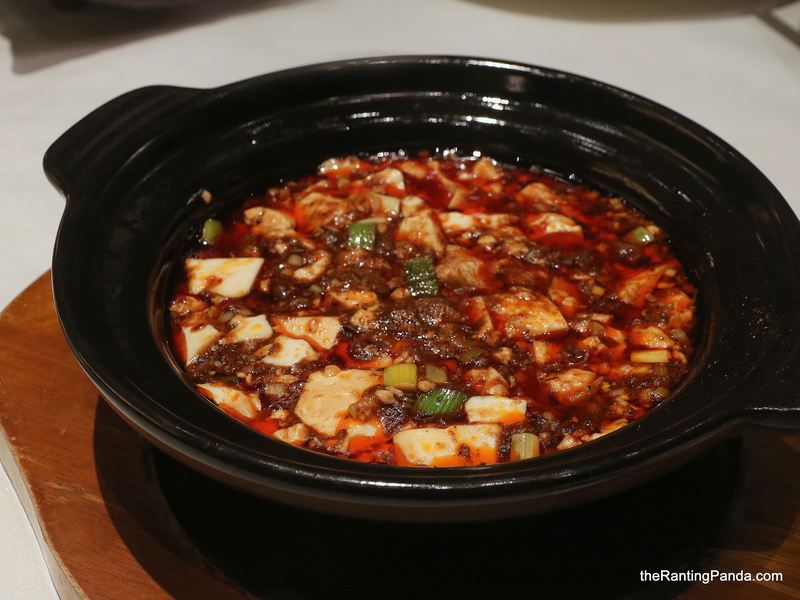 This is one of Chef Kentaro’s signature dishes here, and is essentially fried tofu with hot Szechuan pepper-flavoured meat sauce. I don’t really get much of the peppery taste, but what I enjoy is the spicy kick on the soft and fresh tofu. Needless to say, it is one of the dishes which goes perfectly well with the Japanese white rice. For desserts, I tried both the Coconut Fantasy (S$38) and the Aloe vera and lemongrass jelly with yuzu sorbet (S$8.80). Rants My gripe is with the private rooms, which are furnished with long tables instead of round tables. The long table setting makes it a little awkward for business lunches. Will I Return Again? While prices of the ala carte dishes are relatively steep, I am already quite tempted to return for the weekend brunch set, which offers quite good value as it includes the Peking Duck. The dishes can’t go very wrong here, you will most likely leave feeling satisfied. Make your reservation instantly at Shisen Hanten here.